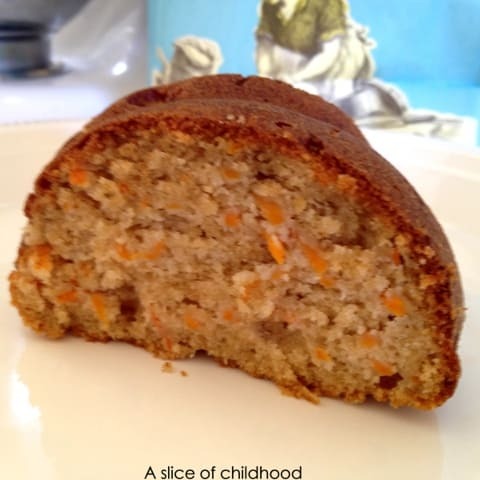 In honor of Mother’s Day, I made one of my favorite childhood recipes, carrot ring. 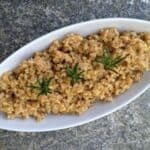 It’s a savory side dish that my mother served for many holidays. The texture is almost cake-like, but it’s not too sweet. As a child, I looked forward to holidays because I wanted to play with my cousins and couldn’t wait to enjoy a slice of carrot ring. In addition to the carrot ring, my mother made many other fabulous dishes. She was an accomplished home cook who loved to entertain and cook homemade food for the family dinner table. Her cooking is legendary among family and friends who still like to reminisce about their favorite dishes that she made. 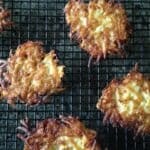 Many recipes are like the carrot ring, old-school 1960’s and 1970’s cooking. My mother was a product of her generation, and she had her share of recipes made with convenience ingredients such as ketchup, ginger snaps, Lipton onion soup mix, Knorr soup mix, and jello. Today I may scoff at the processed ingredients, but I tell you that these dishes would still taste amazing even today. In later years, my mother grew adventurous in the kitchen and learned some Italian and Chinese cooking. She could whip up fresh, seasonal ingredients into tasty pastas and stir-fries. I marveled at how she could do this without using a recipe and without measuring. Her fresh food cooking was ahead of her time in America. I get my inspiration in the kitchen from my mother. As an adult I wanted to continue the family tradition and make the carrot ring for holidays. The recipe was passed down to me on a hand-written note card. When I got the card, I felt lucky to be given the prized, special family recipe. 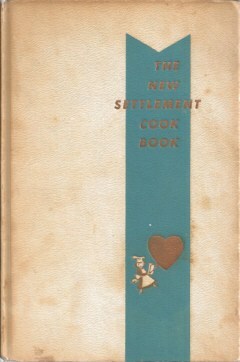 Much later while browsing through my mother’s 1954 edition of the New Settlement Cookbook, I discovered that our family carrot ring recipe is from that cookbook, verbatim. It was a bit of a shock. I also have my grandma’s 1939 edition. Over the years, I have tried to lighten up the carrot ring recipe with varying degrees of success. The original recipe is made with gobs of butter, and I just can’t cook with that much cholesterol. We have a lot more health information today. My problem is that it’s hard to mess with perfection when I know exactly how the dish is supposed to taste after enjoying it so many times over the years. Nevertheless, I have persisted. 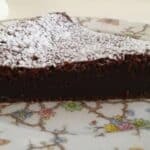 The recipe below is my third attempt, and I am happy with the result. 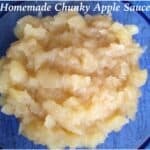 The main change I made is taking out half the butter and substituting with applesauce. I don’t think any dish needs three sticks of butter. Also, my family used Crisco to grease the pan, but it’s not necessary. The ring frees from the pan easily when the pan is carefully buttered and floured. Maybe next time I’ll try substituting a quarter of the white flour for white whole wheat. This “lightened up” version of the carrot ring makes a delicious holiday dinner side dish. Or as fellow food blogger Adair of Lentil Breakdown suggests, the carrot ring can be served as a dessert that is not too sweet. The recipe is flexible for entertaining. I have made the batter the night before, refrigerated it, and then baked it the next day with good results. The dish can be baked earlier in the day, and then briefly reheated in the microwave. Finally, another option is to bake the carrot ring just before you need the oven for the main dish. The ring will “hold” on the counter while it cools a little. With all the flexibility and divine taste, it’s no wonder the carrot ring has been a holiday dinner tradition for generations. 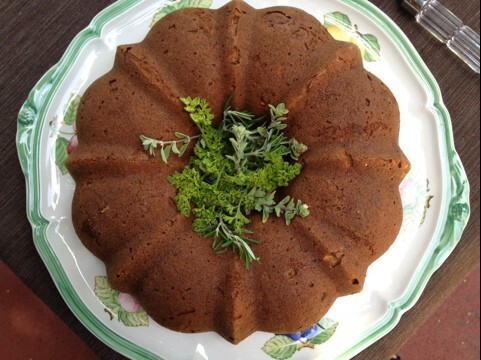 This week I made the carrot ring for a Food Bloggers Los Angeles potluck meeting. Check out the links at the bottom of the post to see more recipes in honor of Mother’s Day. 1. Preheat oven to 375 degrees F (or 350 degrees for convection). Place oven rack in the center or just below. Prepare a 12 cup nonstick Bundt pan by buttering the inside carefully; then dust thoroughly with flour, and tap out all the excess. 2. Measure and sift the dry ingredients: flour, salt, baking powder, and baking soda. Set aside. 3. Cream sugar and butter on medium high speed in a mixer. (For the Kitchen Aid mixer, use the flat beater). 4. Add the wet ingredients to the mixer: applesauce, eggs, carrots, and lemon juice. Mix on medium low. 5. Gradually add the dry ingredients to the wet ingredients mixing on low. 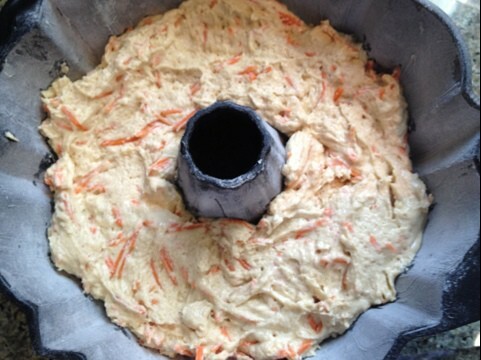 Then put the batter in the prepared Bundt pan. Gently smooth the batter so that it is fairly even in the pan. 6. Bake for about 40 minutes (about 33 minutes in a convection oven). The color should be dark golden brown when ready. Test for doneness like a cake: lightly tap the top surface with your finger. The ring is ready if the indentation springs back and disappears. Note that the ring does not rise as high as a regular cake. 7. Let the carrot ring rest in the pan on a cooling rack for 10 minutes– this is the best time to get the ring to release from the pan. Invert and shake the pan to release the ring onto a cooling rack or serving plate. 8. Garnish the center of the ring with parsley or fresh mixed herbs. Or put warm cooked peas in the center as an additional side dish. Serve warm. I was wondering if you would be willing to share the original recipe with me? My in-laws have been looking for the original recipe for a few years now. Wanting to make it for the holidays. I sent you an email with all the details. I’d love to hear how it turns out! 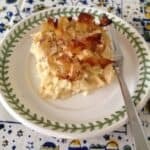 Thank you for sharing this wonderful recipe, I have been looking for it for quite a long time! I just hope that it comes close to what I remember, that would be awesome. Thanks for letting me know. Hope this recipe turns out like you remember it. I had to laugh when I read three sticks of butter, yum! However, it sounds absolutely delicious the way you lightened it up. I’ve never had a carrot ring, but I love anything made with carrots. I can’t wait to give this recipe a try. Thanks for stopping by. I hope you enjoy the recipe. 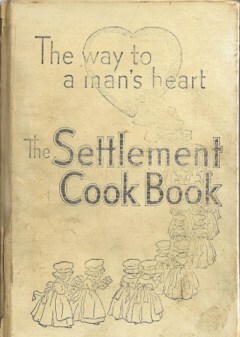 I have that same Settlement Cookbook (1939) that was my grandmother’s, too! I remember my mom making the carrot ring, too? I loved this at the party! I would absolutely serve it as a dessert, maybe even with fresh pineapple chunks or sliced strawberries. Whaddya think? Yes, I like pineapple and carrots together. Glad you enjoyed the dish.